Customer.io is a behavioral email platform that harnesses user activity and profile data to send targeted campaigns at scale. With the Airship Connect and Customer.io integration, incorporate mobile engagement data into your Customer.io profiles and run email campaigns based on Airship events. In order for Airship to send events to Customer.io, you need to register users in Customer.io and associate an email address. See Integrating with Customer.io for more information on registering users. The important thing to remember is that your Airship Named User must match the identifier you send over to Customer.io in your identify call. In the next section we'll show you how to set the Airship Named User to match your Customer ID. In your iOS or Android/Amazon project, set the Airship named user to be the same ID you use in the Customer.io identify call. See iOS: Named Users for more detail. // Associate the channel to a Named User ID. See Android: Named Users for more detail. Under the Connections heading, click Customer.io. Enter your Customer.io Site ID and API key, found in your Customer.io dashboard Integration settings. Once you’ve enabled the integration, we’ll start sending events from this app to your Customer.io instance, and they will appear in your user's activity stream. 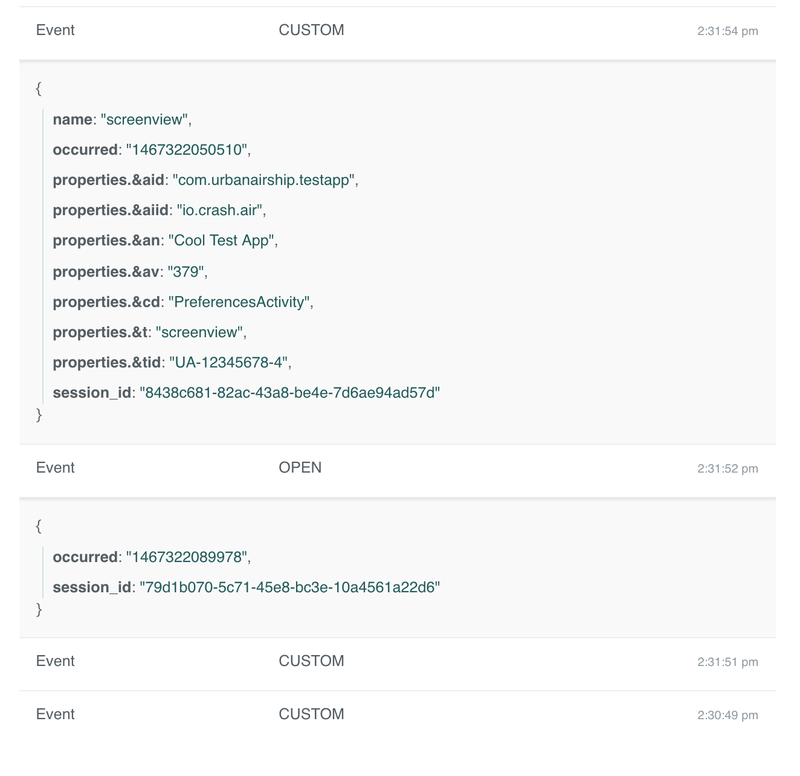 The following example from the Customer.io dashboard shows an expanded custom event and open event. The custom event in this example was instrumented using our Google Analytics Tracker, which passes Google Analytics events to Airship as custom events.